You'll be £14.99 closer to your next £10.00 credit when you purchase Lebanon. What's this? It is axiomatic that the recent history of much of the Eastern Mediterranean is linked to the creation of the state of Israel in May 1948, incontestably so. The country emerged from a series of conflicts and these have continued intermittently ever since, fuelled as much by Arab–Israeli enmity, national pride and territorial aspirations as hostile neighbours. Syria, Jordan, Lebanon and Egypt – and in the latter phases, Iran – were all part of it. There were rich pickings in the regions for the two great powers of the Cold War as they aligned with one side or the other, the Soviets in full support of Arab interests and the Jewish State enjoying the support of Washington. That combination not only led to several Middle Eastern wars but, as we are able to observe in today’s news reports, the knock-on effect continues in Lebanon, Jordan, Egypt and Syria especially. 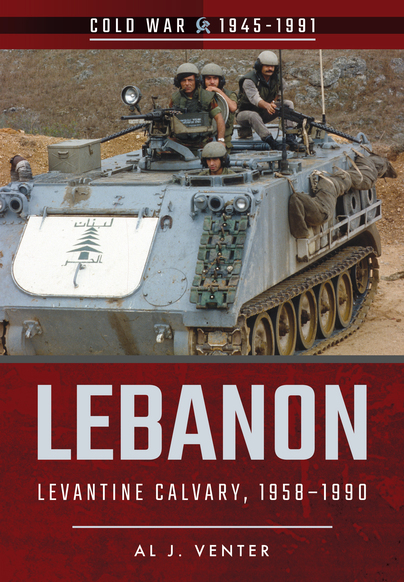 For much of the period under review it was Lebanon that took the brunt of it, with resident Christian, Sunni, Shi’ite as well as Israeli interests deploying multiple levels of force – much of it clandestine – to jockey for predominance. Throughout, land, sea and air forces were involved. Al Venter has devoted a good deal of his career towards covering these developments, from the early 1970s all the way through to the end of the Lebanese civil war in 1991. He has been to war with both Arab and Jew (he was with the IDF strike force headed by Ariel Sharon when he entered Beirut in 1982); spent time in Syria (visited that country’s southern front adjacent to the Golan Heights); been on combat missions with the Israeli-backed South Lebanese Army in the Druze homeland adjacent to Mount Heron and has been embedded with the Lebanese Force Command along Beirut’s Green Line, where many of his photos used in this publication were taken. Venter also spent a lot of time in South Lebanon with UNIFIL, the United Nations Interim Force in Lebanon, and was able to observe from up close the growing influence of the Pasdaran, Tehran’s surrogate force in the region that eventually spawned Hezhollah. His last visit, in 1997, included contacts – while hosted by Lebanese President General Émile Lahoud – with senior Iranian-supported Hezbollah elements in Beirut, one of few Western correspondents to have achieved this distinction. A closeup view of a longstanding, ongoing conflict. Photos can produce unexpected glimpses of armored vehicle details, and the narrative helps fix variants and badging in chronological space. It is interesting as a snapshot of the 1990s in Lebanon. The work is accompanied visually by 122 photographs in black and white and 7 in colour. To this we add a very interesting extra with 4 colour plates with different types of profiles of armament, airplanes, tanks, helicopters and vehicles. An interesting book to read slowly and with first-rate visual documentation. Venter was embedded with several of the combatants and had access to the major players in Lebanon. The text opens with a useful timeline and has been generously illustrated with photographs (many being the author’s own), diagrams and maps. This is a concise, well-written monograph that takes its place in the coverage of the hotly contested Middle East. There is clearly no simple answer as demonstrated by ongoing problems in the region but I found this a very interesting read and enlightening on some of the complexities in Lebanon at least. Well worth a read.